WordPress is a piece of software, similar to an app on your phone or a program on your computer. This software runs on Rockaway Hosting on our servers so when you "install" WordPress with us you're downloading a copy of the software and installing it directly to your domain. You can view information about the software and project at WordPress.org. The company that participates in the development of the software, Automattic Inc., also runs a hosting company specifically for WordPress. And here's where it can get confusing. They named their site WordPress.com. Now there are pros and cons to choosing where to host your WordPress site. 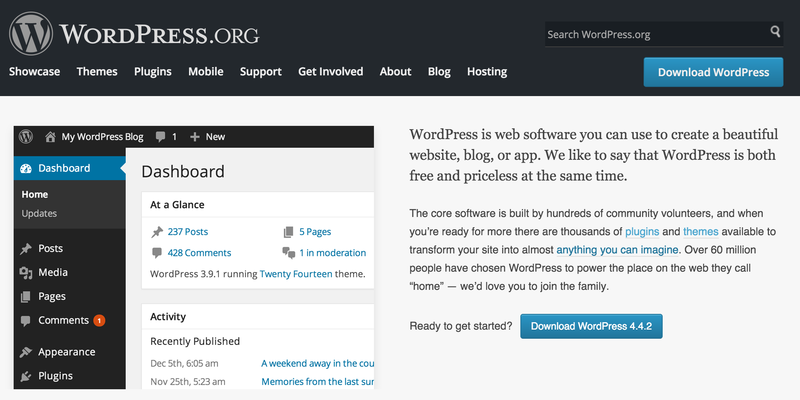 WordPress.com is free for basic needs. They'll give you URL like, example.wordpress.com, and you can run a site there at no cost. Additional options like a custom domain, backups, and other fancy things come with a fee and it's how they make their money. Free sites are ad-supported which is a potential negative there, and the environment is not flexible in that you can't run your own plugins and themes there, only what they make available to you. But they keep things completely up-to-date for you and if your needs are simple it can be a good option at a low cost. Running a WordPress site on Rockaway Hosting gives you the added benefit that you're running the full software and as the administrator, you have access to all WordPress themes and plugins that are publicly available (both free and paid). The flip side is that you'll be responsible for keeping them as well as WordPress up-to-date and since you'll need a domain to run WordPress on in addition to hosting, there's no free option here (though I believe the cost is about as low as possible with us!). So the easiest way to think of these are two different ways to run WordPress with two different companies. Here's where things get tricky. Automattic, Inc, the company that runs WordPress.com, also makes a few very popular plugins that are open source and available to be installed on any WordPress site. Akismet and Jetpack are two perfect examples. These plugins, unlike most that you'll encounter when running WordPress on your own with Rockaway Hosting, require you to "activate" them with a WordPress.com account. I know, just when it seemed clear these were separate spaces entirely there's now a reason to have an account with both. You don't need to necessarily create a site at WordPress.com, but you do need to have a login there in order to use the Akismet or Jetpack plugins. Akismet handles spam protection and Jetpack is a nice suite of tools (think of it like a swiss army knife all-in-one kinda plugin). When you activate either of these plugins in your own installation it will require you to login to WordPress.com to use them similar to how Pinterest will let you log in with Facebook. So while we personally believe there's a lot of great power in running your own version of WordPress at Rockaway Hosting, it's still possible that you might find it useful to have a WordPress.com login to take advantage of the tools they provide to enhance your site. But the two spaces are distinct in that you'd be running your actual site at one or the other.